DID covers a 120+ block area of downtown. 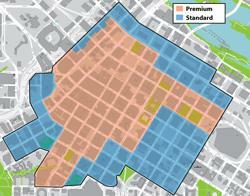 The district is divided into two Service Level Areas: Premium (red) and Standard (blue). The Mpls Downtown Improvement District (DID) is a business-led, 501(c)6 non-profit with a mission to make downtown a vibrant and attractive place for recruiting and retaining businesses, employees, residents, shoppers, students and visitors. This is accomplished by providing services that make over 120 blocks of downtown cleaner, greener and safer. DID also serves as a catalyst, facilitator, convener and promoter of public-private partnerships, collaborations and services that enhance the downtown experience. DID is primarily funded by special service assessments. In 2008, a majority of commercial property owners signed petitions agreeing to the ordinance that created the DID. In 2013, this ordinance was renewed by a substantial majority of commercial property owners agreeing to tax themselves to collectively raise the standard of care and behavior in downtown – with a focus on enhancing competitiveness. By statute, only commercial properties are required to pay the DID assessments. However, as all properties benefit from an improved public realm downtown, some non-profit, government and residential properties voluntarily contribute. More than 1,000 properties consisting of over 64 million square feet of gross building area (GBA) are located within the DID boundaries. Properties are assessed for directly lineal services based on lineal frontage and for more globally benefitting services based on GBA. Charges are prorated to properties based on location within pedestrian service level areas. This three-part method best reflects the volume of people needing service and the level of services delivered. The Board of Directors is comprised of downtown property owners, employers, residents and leaders representing key constituencies and areas of expertise. DID staff oversee vendors, develop programs, advocate for the public realm, communicate with stakeholders and administer the organization. While the DID partners and collaborates with many like-missioned organizations, a few strategic alignments have been integral to an effective and efficient use of resources. In the 1960s, the Nicollet Mall Advisory Board was established by statute to provide advice to the City on all issues related to the Nicollet Mall. When DID was formed, it assumed the roles and responsibilities of the Nicollet Mall Advisory Board. In 2006, Minneapolis SafeZone Collaborative (MSZ) was formed as a 501(c)3 to bring public and private sectors together through collaborative strategies in safety, greening and other projects that enhance downtown and improve safety. In 2009, MSZ became a wholly-controlled subsidiary of DID, giving it stability to successfully continue public-private collaborations, and a broader platform from which to establish initiatives for downtown. Effective January 1, 2013, the boards of the DID and the mpls downtown council voted to align their governance structure, allowing for the same individuals to serve on the boards of both organizations, establishing the DID as a wholly-controlled subsidiary. This served to broaden the leadership team, thereby providing more resources and experience, enhancing the existing services and assuring that both organizations are unified in their mutual efforts to make downtown Mpls extraordinary. To support, preserve, create and enhance a vibrant, competitive and thriving downtown that attracts and retains businesses, employees, residents and visitors.